On Oahu’s north shore, the tranquil town of Kahuku is defined by Hawaii’s natural beauty and fusion of local cultures. Nestled between the dramatic Ko‘olau Mountains and world-class surf destinations, it’s home to a small community that enjoys the simple life away from the bustle of urban centers, with one individual who has a talent for transforming Hawaii’s seascapes into works of art. Born in Sao Paulo, Brazil, Hilton Alves grew up to become a waterman, community leader, and skilled painter. 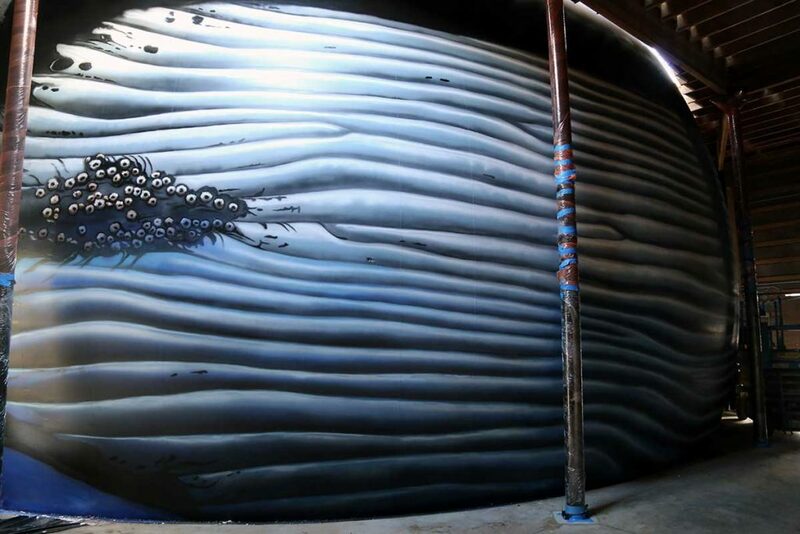 He was always inspired by the beauty of the ocean, expressing his creativity through art mediums including large-scale murals. 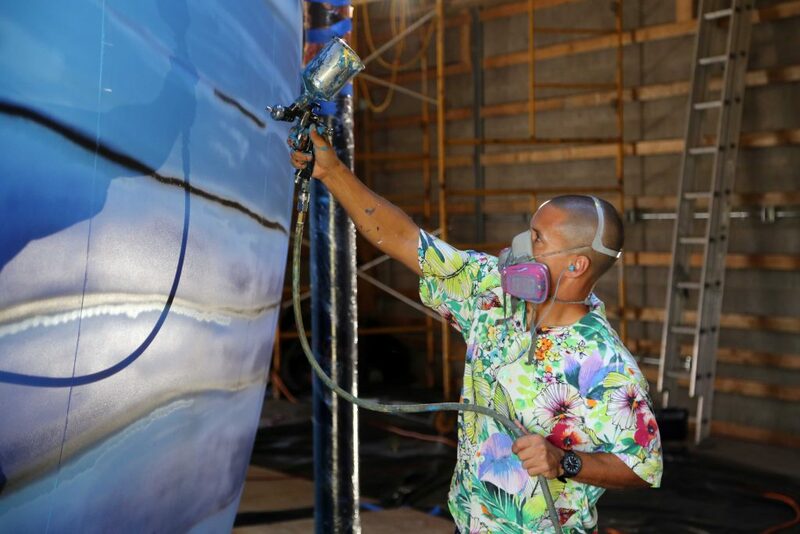 Hilton began his global quest to paint “101 Perfect Waves” in Kalihi, Oahu, where he painted the Banzai Pipeline over 14,000 square-ft of wall space. Hilton is no stranger to Maui, as his third Perfect Wave of Honolua Bay is painted on Lower Main Street, Wailuku. 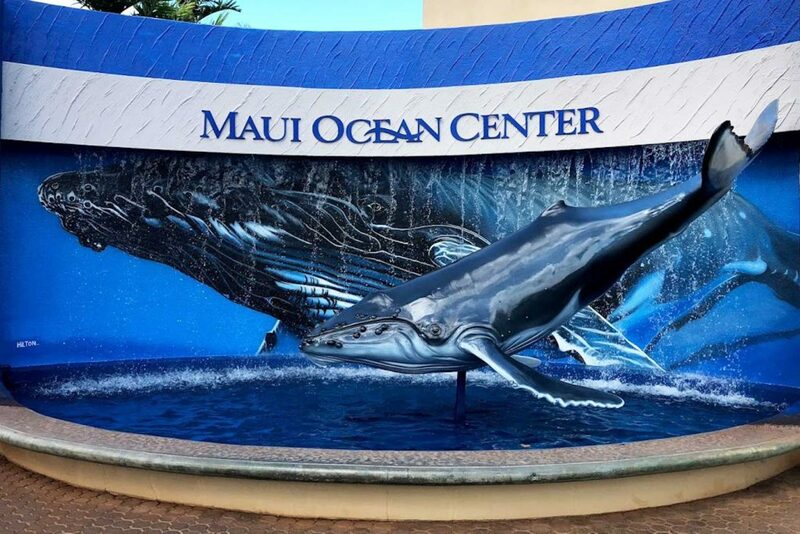 The first mural was a revitalization of Maui Ocean Center’s dolphin water feature. 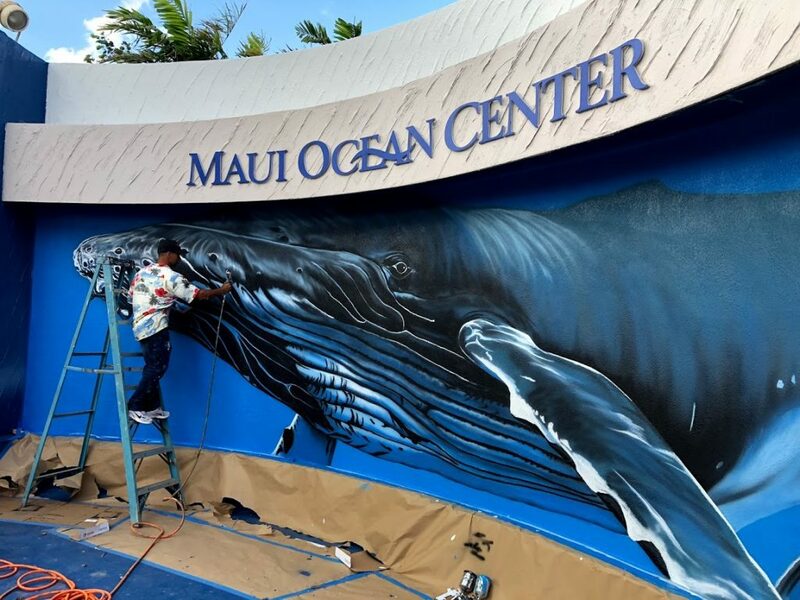 Working with the Aquarium’s Exhibit Designer, Chris Masterson, the vision called for an image of a mother humpback whale escorting her young calf, an iconic symbol of the great humpback whale migration to Hawaii. Using nothing but an image as a reference, Hilton used an airbrush to paint the mother humpback without the use of templates or guides. A repurposed humpback whale calf model brought a 3D element to the refreshed water feature. Murals are often centerpieces of communities and landmarks that help create a sense of place for residents and visitors. For Maui Nui, humpback whales have largely contributed to Maui’s identity and why living here in the islands is so unique.